« Would You Order This? This is something I’ve been meaning to ask about for a while. 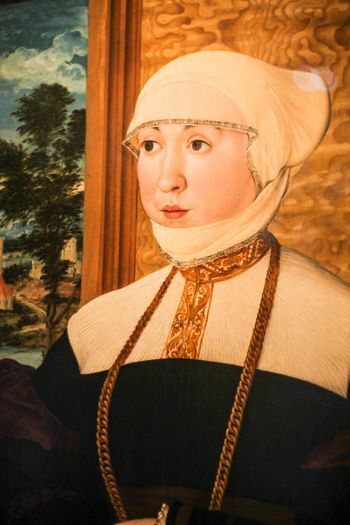 While in London, fiance and I went to see the Old Masters at the Courtauld Gallery, and I noticed the below portrait, which the info card said was of Anna Reitmor, a Dutch (I think) noblewoman. The info card also said that there was another half of this portrait, so to speak, which was of her husband, Peter. Curiously, the National Gallery entry for the work doesn’t say that it is for certain Peter (it might be another male member of the Froschl family) but I’m convinced solely based on background. And so that begs the question: Shouldn’t the Courtauld and/or the National Gallery have hired a researcher to determine whether or not these two had a happy marriage? And if they did, shouldn’t every effort have been made to keep their likenesses together? This entry was posted on June 12, 2015 at 10:04 pm and is filed under Conspiracy Theories, Image Craving. You can follow any responses to this entry through the RSS 2.0 feed. You can leave a response, or trackback from your own site.